At the theatre or opera, at concerts, or popular lectures, at “commencements,” and other prosperous and happy public entertainments, a certain gayety of manner may be in harmony with the occasion; but it should be under control, a smiling cheerfulness, not a free-and-easy jollity. Before the play, or the programme, begins, social conversation is usually allowable in quiet tones that do not disturb the surrounding people. A gentle hum of lively voices is not an unpleasant overture on such occasions. But the moment the orchestra begins, if at the theatre, or the instant that the meeting is called to order by any initial feature of the programme, silence should fall upon the assembly, and not a whisper be heard. Polite attention should be given to each feature of the hour. Programmes should be folded and arranged for easy reference before the exercises begin, so that no rustling of papers shall mar the effect of the music, or interfere with the speakers or listeners. The noisy handling of programmes is a most exasperating exhibition of thoughtlessness, and can easily be avoided by a little caution. 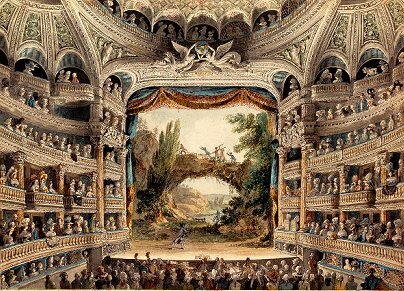 It should be accounted a matter of good form not to be late in arriving at the theatre, opera, etc. People sometimes think that because their seats are secured by their ticket-coupons, it makes no difference whether they are in their places before the curtain rises or not. But it is inconsistent for people who would be thought to be well-mannered, to inflict on others so much annoyance as is the result of coming late and making a commotion arranging seats, etc., after a drama is in progress, or a lecture or concert begun. When this happens, it should be the rare and unavoidable accident of detention, not the habitual and perhaps even ostentatious custom that it seems to be with some people. The noise about the swing-doors, and the rustle in the aisles, the banging of hinged seats, and the occasional parley with the usher, render the seats under the galleries practically valueless during the first half of the performance, since the speakers cannot be heard in the midst of the confusion. The “sense” of the opening act being lost, the entire play is marred simply because forty or fifty people are ten or fifteen minutes late. If managers would combine and agree to order the doors closed several minutes before the performance begins, it would soon remedy the trouble, and a host of patrons would applaud their course. The most aggravating thing about annoyances of this kind is that they are inflicted by the very few, and suffered by the very many. In crowded theatres and lecture halls, heavy coats and wraps must be disposed within each owner’s own territory. They should not lie over the top of the seat or bulge over into the adjoining seats to encroach upon other people. Nor should the owner of a big overcoat double it up into a cushion and sit upon it, to raise himself six inches higher, to the disadvantage of the person seated back of him–a selfish preparation to see the sights which we sometimes observe, even in the parquet centre. The fashion, now almost universal, of removing hats at all spectacular entertainments, does away with what was formerly a conspicuous source of annoyance. For awhile this downfall of view-obstructing millinery promised a “square deal” to the occupants of the back rows. But of late vanity has re-asserted itself in the guise of elaborate hair-dressing, until the aigrette and the bow have become as great an imposition as was their predecessor, the flaring hat. This evasion of the issue will be more difficult to control by public prohibition. It remains for the polite woman to avoid adopting, for such occasions, the towering head-dress that evokes not admiration but execration from the people seated behind her. No woman need risk annoying others in order to be attractive herself; there are numerous styles that are both unobtrusive and becoming. Moreover, the woman in good society has ample opportunity to exhibit her elaborate coiffure at private social functions. People who wish to leave the theatre between the acts should make it a point to secure end seats and not scrape past half a dozen other people three or four times during the performance. If it is necessary to trouble other people to rise and step aside to allow one to take or to leave his seat, the person thus obliged should preface the action with “I beg pardon,” or “May I trouble you to allow me to pass;”–and should acknowledge the obligation by saying “Thank you.” This may not lessen the inconvenience to other people, but it may mollify the feeling of irritability that such things naturally arouse. It ought to be superfluous to say that talking aloud, or continuous whispering during the progress of a play or opera or concert, usually on topics foreign to the occasion, is a rudeness to the performers and a bold impertinence to the rest of the audience. Some people are guilty of this insolence wittingly and unblushingly. For such we have no word of advice. Such instances should be met by something more effective than “gentle influence.” But many, especially young people, talk and laugh thoughtlessly, and from mere exuberance of animal spirits. It is to be hoped that on pausing to reflect they will carefully avoid forming a habit of public misbehavior that will ultimately rank them in the social scale as confirmed vulgarians. An intelligent listener never interrupts. Between the scenes of a play, or the successive numbers of a concert programme, there are pauses long enough for a brief exchange of comment between two friends who are sharing an entertainment, and they may enjoy the pleasure of thus comparing notes without once disturbing the order of the time and place. At a spectacular entertainment, it is very rude for those in front to stand up in order to see better, thus cutting off all view for those back of them. 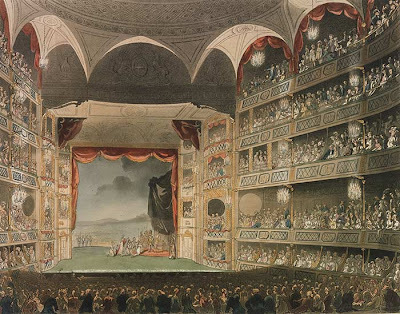 The disposition to do this is very strong in rural audiences, where the flat floor of the school-house or hall gives little chance for the observers seated back of the first few “rows.” But one may better lose part of the “tableau” on the stage than to furnish another one on the floor of the house. At a lecture, a special personal respect is due to the speaker. This is shown by a courteous attention and a general demeanor of interest and appreciation. If applause is merited, it should be given in a refined manner. The stamping of the feet is coarse, and the pounding of the floor with canes and umbrellas is as lazy as it is noisy. The clapping of hands is a natural language of delight, and, when skillfully done, is an enthusiastic expression of approbation. Some effort is being made to substitute the waving of handkerchiefs as a symbol of approval or greeting to a favorite speaker, but it is quite probable that this silent signal will not take the place of the more active demonstration of clapping the hands, except on very quiet and intellectual occasions. Shall ladies join in applause? As a matter of fact, women seldom applaud, but not because propriety necessarily forbids; it is chiefly because the tight-fitting kid glove renders “clapping” a mechanical impossibility. Feminine enthusiasm is quite equal to it at times, as, for instance, when listening to a favorite elocutionist or violinist. There is no reason why ladies may not “clap,” if they can. It certainly is quite as lady-like and orderly as for them to give vent to their enthusiasm, as many do, in audible exclamations of “Too sweet for anything!” “Just too lovely!” etc., all of which might have been “conducted off” at the finger-tips if hand-clapping had been a feasible medium of expression. Applause may be a very effective and graceful exponent of gentlemanly appreciation if given with discrimination; but if too ready and frequent, it ceases to have any point, and becomes commonplace. While a man of taste will applaud heartily on occasion, he will refrain from extravagant and continuous clapping. The observance of the proprieties of time, place, and occasion are nowhere more urgent than at church. Much of the liberty that is granted on secular occasions is entirely out of place in church. While quiet greetings may be exchanged at the church door, or in the outer vestibules, before and after service, it is not decorous to chat sociably along the aisles, or hold a gossiping conference in whispers with some one in the neighboring pew. I have in mind one woman, who ought to have known better, whose sibilant utterances–just five pews distant–came to be a regular part of the five minutes’ pause immediately before the service began. Her conversation was usually directed to another woman, who, likewise, should have known better than to listen. The silent vault of the church roof echoed to the vigorous whispering up to the instant that the clergyman began, in low monotone, “The Lord is in His holy temple”–a fact which the whisperer had obviously forgotten–“let all the earth keep silence before Him”–an injunction which she never seemed to be able to remember from week to week. It is one of the worst violations of good form to behave with levity in church. To devout people the church is the place for meditation and prayer, and nothing should be allowed to disturb the restful calm that is sought within its sacred walls. A well-bred agnostic will respect the religious sentiments of other people, whatever his own beliefs or disbeliefs in matters theological. If no higher law is recognized, at least every one will regard the etiquette of the case, which requires that the demeanor of every one within the walls of the church shall be reverent. It is proper to dress plainly and neatly for church; to enter the portal quietly, to walk up the aisle in a leisurely but direct way, and be seated at once with an air of repose. If cushions or books require rearranging, it should be done with as little effort as possible. Every movement should be quiet, and the rattling of fans and of books in the rack, and “fidgeting” changes of position should be avoided. The movements in rising, sitting, and kneeling should be deliberate enough for grace, and cautious enough to avert accidents, like hitting the pew-railings, knocking down umbrellas, or kicking over footstools. No sounds but the inevitable rustle of garments should attend the changes of posture during the service. Not unfrequently several canes and as many hymn-books clatter to the floor with each rise of the congregation, because of somebody’s nervous haste. Children are often responsible for these little accidents, and of course are excusable, but they should be early taught to observe caution in these little matters. The clergyman should have the undivided attention of his hearers. During the lesson and the sermon, one should watch the face of the reader, or speaker, and give to the minister all the inspiration that an earnest expounder may find in the face of an intelligent listener. It is probably thoughtless, not intentional, disrespect–but still disrespect–for a person to spend “sermon time” studying the stained-glass windows or the symbolical fresco, interesting as these things may be. The singing of the choir may be good; if so, one should not listen to it with the air of a connoisseur at a grand concert. Or the singing may be very poor; that fact should not be emphasized by the scowling countenance of the critic in the pews. A mind absorbed in true devotion does not measure church singing by secular standards. The spirit may be woefully lacking in the most artistic rendition: it may be vitally present in the most humble song of worship. While we may with righteous indignation condemn the sacrilege of a spiritless or irreverent singing of the sublime service of the church, it is very bad form to sneer at the earnest and sincere work of a choir whose “limitations,” in natural gifts or culture, render their work somewhat commonplace. It is good form to respect all that is honest in religion, and to reserve sharp criticism for the shams and hypocrisies that cast discredit on the church. A regular “pew-owner” in a church should be hospitable to strangers, and cheerfully give them a place in his pew, offering them books and hymnals, and aiding them to follow the service if they seem to be unaccustomed to its forms. At the same time it is only fair to say that this duty becomes a heavy tax on generosity and patience when, as in some very popular churches, a floating crowd of sight-seers each Sunday invade the pews, to the serious discomfort of the regular occupants. People who attend church as strangers should remember that they do so by courtesy of the regular attendants. A broad view of the church opening its doors to all the world is theoretically true, but practically subject to provisos. A church visitor who observes much the same care not to be intrusive which good form would require him to observe if visiting at a private house, will usually be rewarded with a polite welcome. The stranger attending church should wait at the foot of the aisle until an usher conducts him to a seat, as the usher will know where a stranger can be received with least inconvenience to others in the pew. The stranger should not take possession of family hymn-books, or fans, or select the best hassock, or otherwise appropriate the comforts of the pew, unless invited to do so by the owner, whose guest he is, in a sense. If attentions are not shown him, he must not betray surprise or resentment, nor look around speculatively for the hymn-book that is not forthcoming. If the service is strange to him, he should at least conform to its salient forms, rising with the congregation, and not sitting throughout like a stolid spectator of a scene in which he has no part. The head should be bowed during the prayers, and the eyes at least cast down, if not closed. To sit and stare at a minister while he is praying is a grotesque rudeness worthy of a heathen barbarian, yet one sometimes committed by the civilized Caucasian. The incident may escape the knowledge of the well-mannered portion of the congregation, who are themselves bowed in reverent attitude; but the roving eye of some infant discovers the fact, and it is at once announced; and worst of all, the child unconsciously gets an influential lesson in misbehavior in church from the “important” man who thus disregards the proprieties.